Beautiful, with an unimaginable strength and with a profound sensibility; Friducha is, without any doubt, one of my favorites. Son of a German and a mother descendant from Spanish and Mexican indigenous, Frida Kahlo was born in 1907. However, she would claim that he was born in 1910, to be directly associated with the Mexican revolution, as she and her husband Diego Rivera were active communists. Being 18, Frida takes a bus that crash with a trolley car and suffers multiple wounds. A handrail pierces her abdomen and uterus, damaging her reproductive ability; and her spine, severely compromised, takes her to spend long periods of time without moving in her bed, with an unspeakable pain. Thanks to an easel designed by her mother, Frida starts painting in her own bed. Later on, she gives up her ambitions to pursuit a career in medicine to devote herself to art. She meets Diego Rivera, another Mexican artist to whom she marries at 22. This marriage, however, was difficult, full of infidelities, treasons and psychological abuse. But, apart from the misfortune of their relationship, Rivera and Frida stimulated each other artistically, being both acknowledged as two of the most important Mexican artists in the world. Frida’s work is, without any doubt, autobiographic in some way or another. Almost half of her production are self portraits, full of symbols and images; and full of bright colors. Both characteristics of her work are associated with the influence that Mexican indigenous art had on Kahlo. Her canvases are raw and speak of the pain Frida experienced. With no regards or masks, our artist paints several motifs, including her health issues, her miscarriages or her relationship with Rivera. Despite her completely lack of technique, her works are compensated by the emotion and character she puts in every one of them. There are several stages in looking at a painting by Frida: at first, you feel horrified, but later you feel compassionate and, at last, you end absorbed by her strength of spirit and intense passion. 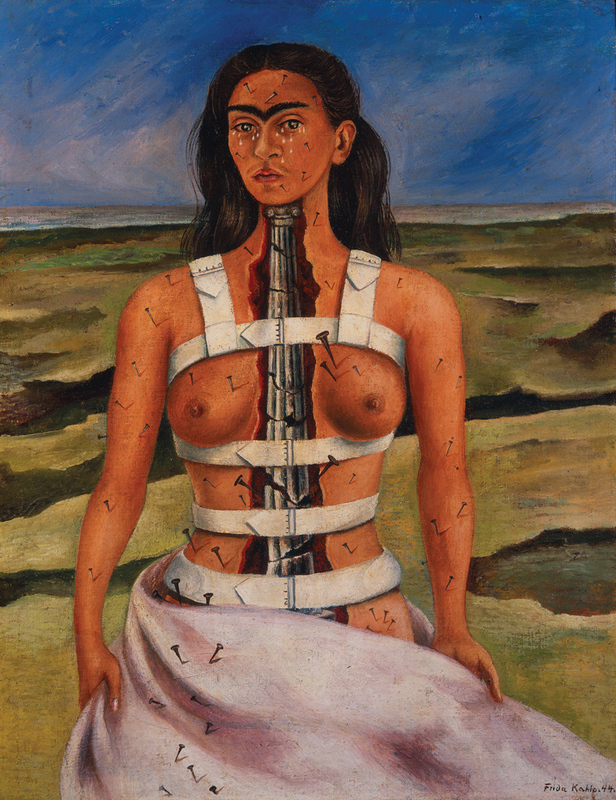 Regarding The broken column, Frida self portraits her with an open torso and a jonic column representing her spine. Broken in several areas, she makes a clear reference to the consequences of her accident in the bus. The white harness in the paintings represents the iron corset she had to wear in 1944 to hold her spine. This corset gives us the impression that it seems the only thing that holds Frida’s body together from complete disintegration. We also can see her body nailed, expression of an acute and continuous pain; and, at the same time, real in Frida’s life. 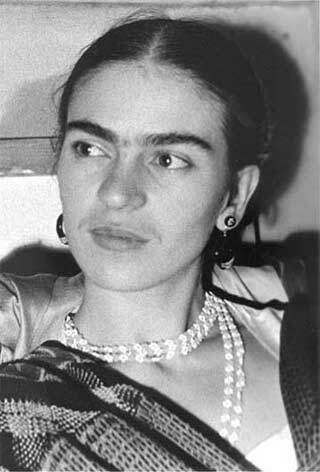 If we pay attention, we can see that the biggest nail is stuck in Frida’s heart and this is interpreted as a product of her relationship with Rivera. One weird thing is that Frida, in this painting, appears alone. The artist generally painted herself with animals like monkeys, parrots or cats; or also she painted herself with some plants or leaves. But, in The broken column, she is alone in a desert, under a stormy sky and with tears in her eyes. As I said, for all of this, Frida is one of my favorites. A genuine artist. 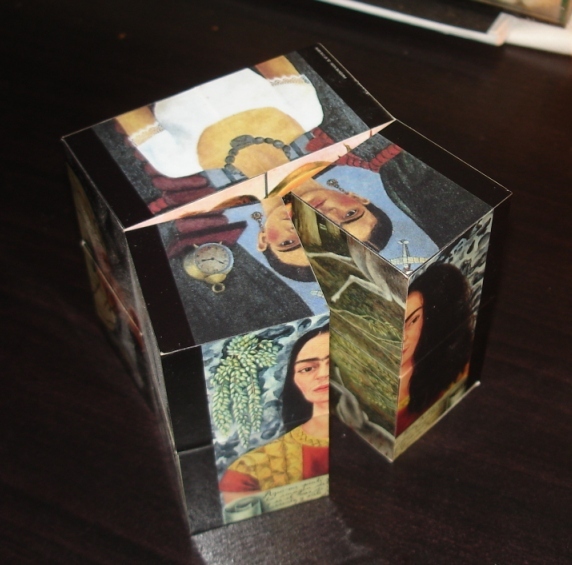 This post is dedicated to my Mexican friend Paola Lozano, who gave me this bizarre cube of Frida in which you can put together several paintings by her. ~ by Álvaro Mazzino on September 7, 2010. Buy original abstract, surrealism oil paintings of Ukrainian artist Pisarev Gennagiy…. still care for to keep it smart. I cant wait to learn far more from you. This entry was posted on September 7, 2010 at 10:58 and is filed under Surrealism, Symbolism.You can follow any responses to this entry through the RSS 2.0 feed.You can leave a response, or trackback from your own site.